At the off grid prefab house, there was rain, sun, and chaos. Ahhh, spring! We are working on a modified Dogtrot Mod modern prefab house from our Green Cabin Kits line for a project in the south. I am jokingly calling it the Dogtrot Mod Mod, aka the Dogtrot Mod². Ba dum, dum. Hopefully I'll get to talk more about this prefab project soon! At our own modern prefab house (from Green Modern Kits), Nephew 3 came out to spend his spring break with us. It was chaos: they built trails, dams, breached and rebuilt dams, rode dirt bikes, ran wild with horses, dogs, and chickens, invented things, destroyed things. We cherished every moment. It was a week of ruckus and the dogs happily joined in! 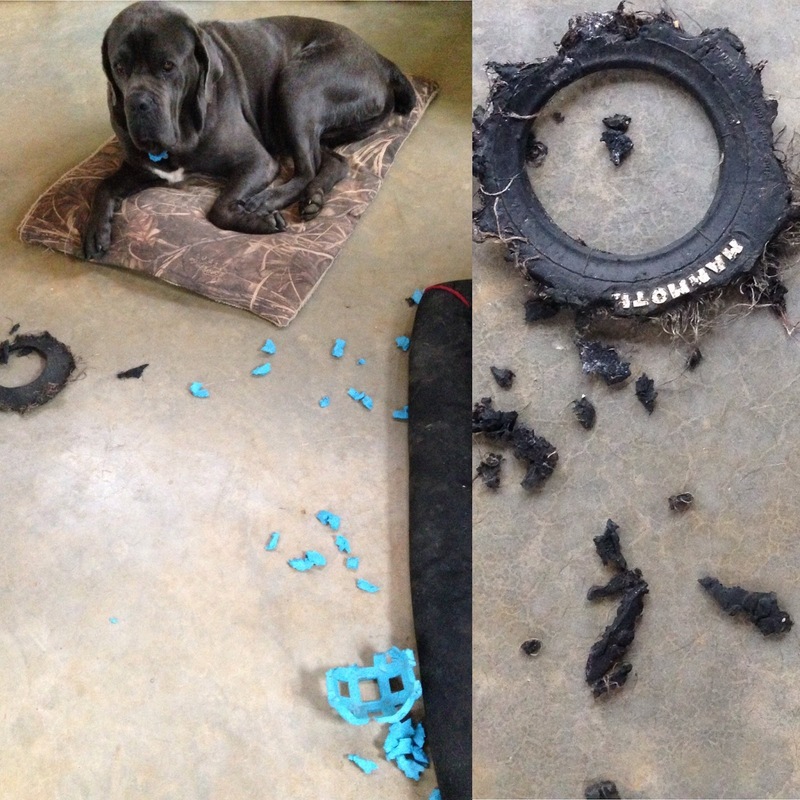 Oh: here's a friendly PSA on why you don't let mastiffs bring their toys in the house. This lil' boo is a MESS. At least with a concrete floor and a minimalist mindset, the chaos is easy to clean up. There was rain, but inside the off grid prefab house there was plenty of daylight, thanks to the passive solar design of the prefab. Living in a rural environment, you have to make your own path and often, your own job. That's why so many people leave, because it is not sustainable when there are a lack of jobs. What we share with the Amish is that we bring our own jobs with us here. Except that this family telecommutes. I'm working hard, the dog not so much. For light reading that's The Economist tucked under the laptop, ha. Spending hours in the woods, look what the kids brought in for dinner! 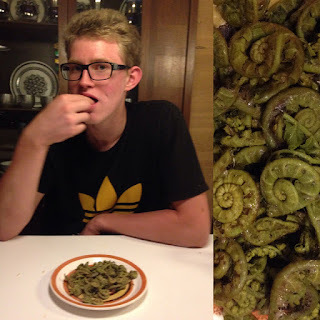 Yes, it is the season for fiddlehead ferns. Even Nephew 3 ate them. They really were so creative and active. Someone's child may or may not have made a working gun out of trash found along the road and spare parts. With all this chaos, I tried to relax. At the end of the week, we headed into the city for my high school reunion! L.A., Colorado, Miami, D.C. and... me, population 40! We finished the weekend seeing so many dear friends. We meandered the city, wandering around art, stopping in for great food and company. Nosing around thrift stores, imagine my surprise to find a mid-century modern wardrobe! Rare enough, but it was even the U.K.'s storied Gomme Furniture Wycombe!!! What a cool furniture collection, including the infamous G-Plan. HW Furniture Archive has a whole huge archive of the Gomme Furniture / G-Plan, check it out!!! Once you start scrolling in there you won't be able to stop. Here is a fascinating history of Gomme, G-Plan and the evolution of the post-war furniture industry. "The G-Plan range appeared just at the right time – when consumers wanted a change from the limited choice of the utility furniture of the Second World War and the dark brown, chunky furniture of earlier decades. G-Plan’s light oak furniture was stylish, attractive, adventurous and had a contemporary feel. It could also be bought a piece at a time. While retailers determined the styles of furniture, which most manufacturers produced, G-Plan went over retailers’ heads and appealed directly to the public through a national advertising campaign. G-Plan pioneered the display of furniture in complete room settings with accessories. The range became hugely successful. At one point there was an 18-month delivery wait and other manufacturers copied styles." I love that you can order it in "duck egg green." People knew that color, then. You can see why Gomme, and G-Plan, were so popular. 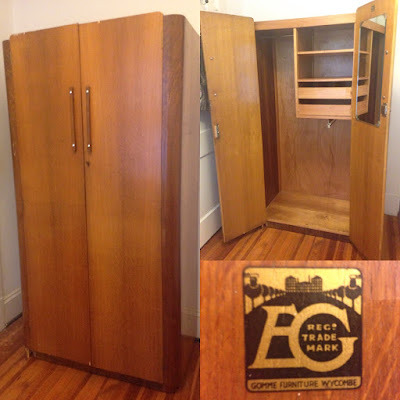 Inspecting my own thrift store find, you can see how well made it is- I love the lines and simplicity of detail. SO simple, so well crafted. That was a lucky frugal find! How did it end up all the way here from the U.K.? You go, G-Plan. Well, maybe without those mirrors over the beds, ha. But otherwise you're cool. I'll be keeping an eye out for more. In the meantime, have a great week.